In 2017, India overtook China to emerge as a global leader in the two-wheelers market. India produced a total of 19.9 million two-wheeler vehicles, followed by China at 14.3 million units. 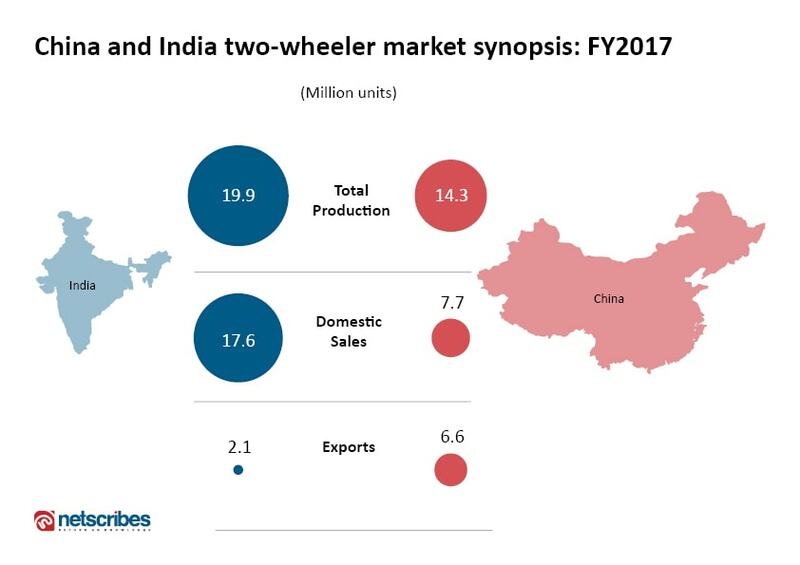 China, however, remains the leading exporter of two-wheelers, having shipped 6.6 million units in FY2017 compared to India’s count of 2.3 million units during the same period. When trying to make sense of this exponential growth, a top official at Hero MotoCorp said, “The massive government spending in rural programs and large road-construction projects is leading to a pickup in volumes in smaller towns and villages.” Besides the growing infrastructure and rising incomes in the rural areas, one of the primary reasons for the spurt in sales has been the rise of women commuters. For Honda alone, the share of women scooter drivers stands at 35%. India’s two-wheeler industry is highly competitive and is dominated by four major players: Hero MotoCorp, TVS, Honda, and Bajaj. 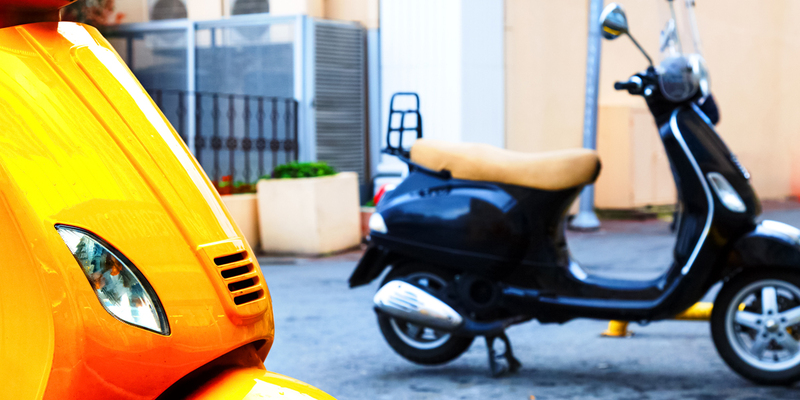 Together, they account for 88% of two-wheeler vehicle production, which comprises of motorcycles, scooters, mopeds, and electric vehicles. Why the ‘top manufacturer’ tag? In addition to the sturdy growth in demand due to a young population and rising middle-class income, India offers significant cost advantages. Auto firms save nearly 10-25% on operations vis-à-vis Latin America and Europe. Rising investments in terms of FDI inflow, of around US$ 16.7 billion in the two-wheeler sector, have paved the way for opportunities in manufacturing. The Government’s plan to lay out INR 25 trillion in the near future will be a driving force to frame business strategies. Moreover, the Government wants to develop India as a major R&D hub and a global manufacturing center. The Automotive Mission Plan, too, received extensive policy support with reforms in Goods and Services Tax (GST) regulations to boost sector growth. Original Equipment Manufacturers (OEM) perceive India as one of the high growth markets. However, OEMs need to leverage potent distribution networks and offer better aftersales services to be successful in the two-wheeler landscape. If Porter’s model were to be applied to the two-wheeler market, one can safely say that the threat of new entrants is very low. The threat from substitute players is minimal, with public transportation still underdeveloped even in cities. On one hand, the bargaining power of most automobile businesses continues to remain low since they cater to specific client requests. On the other hand, the bargaining power of buyers is high due to the availability of several options from different manufacturers. A promising future: Only for manufacturing? The Automotive Mission Plan (AMP) 2016-26, presented at the SIAM conference, envisions building India into one of the top automotive manufacturing hubs in the world. A promising revenue target of $300 billion has already been set for FY2026. The plan will be instrumental in the creation of 100 million jobs and fuel $80 billion in CapEx investments. The AMP 2016-26 has been also aligned with the Make in India campaign. However, the Make in India initiative still faces some brand perception challenges, which could be overcome by extending value-added services such as quality management, technological enhancements, and improved safety measures. The Indian Government has already spent a hefty amount of $280 million to develop crash-test centers and centers of excellence. The centers are meant to comply with advanced industry norms and streamline the implementation of AMP. Of the total 19.9 million units sold in India in FY17, 88% were sold in the domestic market, while only 12% contributed to exports. China’s percentage of exports, however, stood higher at around 46% during the same period. India concentrates more on the domestic market, unlike China which depends primarily on exports. In China, the domestic demand is low owing to strict laws governing two-wheelers. Furthermore, the use of motorcycles is banned in nearly 200 cities and a few downtown areas. China also limits the distribution of number plates to control traffic on roads. 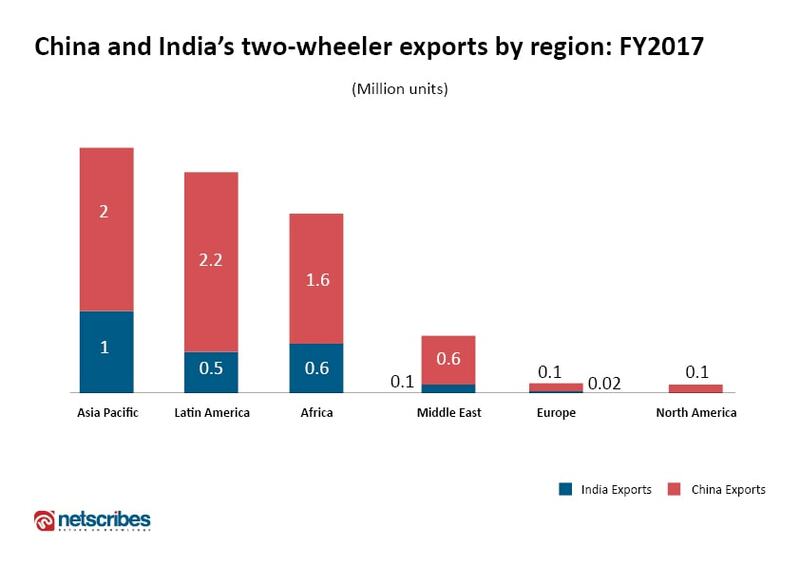 Top export destinations for Indian and Chinese two-wheeler manufacturers are Africa, the Asia-Pacific, and Latin America, accounting for 25%, 34%, and 31% of total exports, respectively. Europe and North America together account for 3% of exports, with the Middle East’s share at 7%. Africa, the Asia-Pacific, and Latin America have a current combined demand of 7.9 million units; however, India contributes to only a fourth (i.e., approx. 2 million units). India’s two-wheeler exports are limited to 15 countries, including Sri Lanka, Bangladesh, Colombia, Nigeria, and the Philippines, which account for 88% of exports. Wang Jingyu GM of Keeway Motor strongly believes that Indian bikes are very popular in some markets such as Colombia, where they occupy at least one-third of the whole market. But their export market is only dominated by five major brands and the competition is not enough to mobilize export dynamics. As such, the competition has reached a stagnant state “which has become a kind of a benign competition,” Wang explains. Two-wheeler companies should introduce improved designs and assess performance and market requirements to navigate new terrains. To penetrate fertile geographies, Indian brands must work with top-level distributors. These distributors will eventually have to devise sound marketing strategies and persuasive selling points for Indian bikes. A winning policy will include innovative and low-cost products for South American markets, along with high configuration design and robust aftersales service. Automobile businesses must also make the investment necessary to produce a motorcycle model suitable for each geography. While the Government’s plan to promote India as a top manufacturing hub is promising, there remains the need to set up manufacturing units outside its own boundaries to make this a reality. Working hand in hand, auto companies and the Government need to focus on untapped markets to beat China. Looking for competitive intelligence in the Automotive sector? We can help. Reach out to us at [email protected].